Infamous for his political views, conspiracy theories, and Hollywood scandals, actor Charlie Sheen has become the perfect character for a Halloween costume this year. 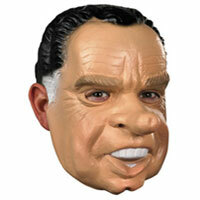 He's an ideal costume choice for those who want to disguise themselves as one of most notorious celebrities. Full of Tiger blood, this former TV sitcom star of Two and A Half Men is a hilarious and crazy costume idea for those who want attention on Halloween night. 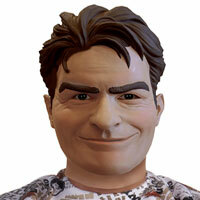 An affordable vinyl mask controversial actor Charlie Sheen. Have a wild and crazy Halloween with this outrageous movie star mask. One size fits most adults. An officially licensed Charlie Sheen merchandise! 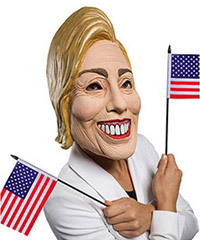 This affordable economy Halloween costume kit includes a character face mask and t-shirt. 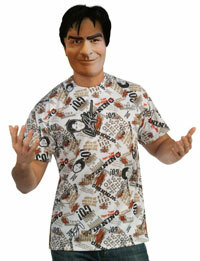 This is an officially licensed Charlie Sheen costume kit. Special low sale price for Halloween!